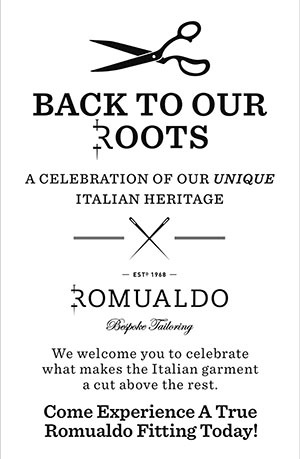 Sirs: The neighbors propose a meeting at our house for the purpose of giving a name to our embryo village, on the 4th inst., upon which occasion we hope to have the pleasure of seeing yourselves and wives. Do not fail to come with names. 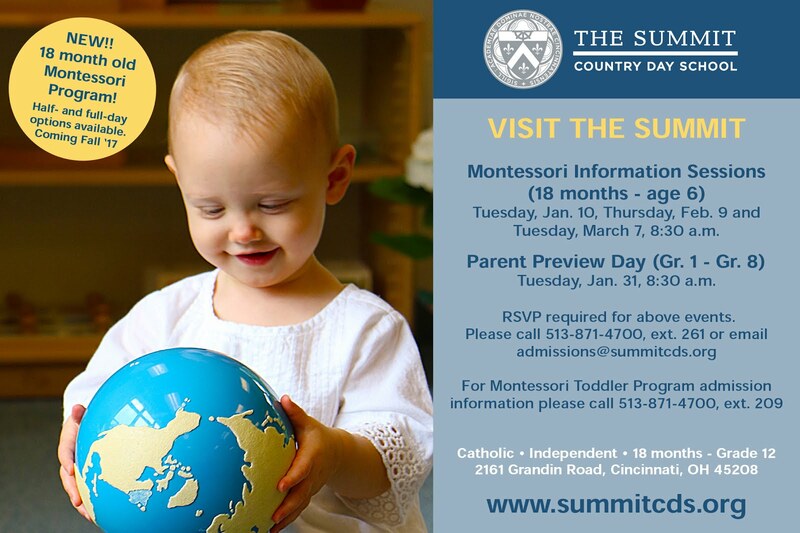 Ladies will be expected to participate. Cathy and Tony Ramstetter posed in front of the new historical marker at their home, Twin Oaks. Significant growth in Wyoming had occurred following implementation of service in 1851 by the Cincinnati, Hamilton, and Dayton Railroad. Soon after, residential subdivisions were developed to take advantage of the access to and from downtown Cincinnati that the train provided. Mr. Reily himself broke a tie in the voting by selecting “Wyoming” – it is the Indian name Maughwanwame that means “broad valley”. In 1874, Wyoming officially became a village with 600 residents. 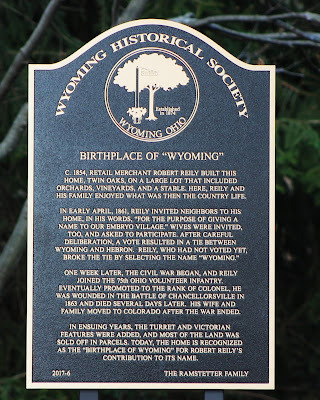 A new historical marker was added to the “Birthplace of Wyoming”. To honor this event and document it for current and future generations of our community, a historical marker was created, placed in front of Twin Oaks and dedicated on the evening of April 4, 2018. Attendees included the current owners of Twin Oaks - Tony and Cathy Ramstetter, Mayor Barry Porter, City Manager Lynn Tetley, and about 40 other members and supporters of the Historical Society. 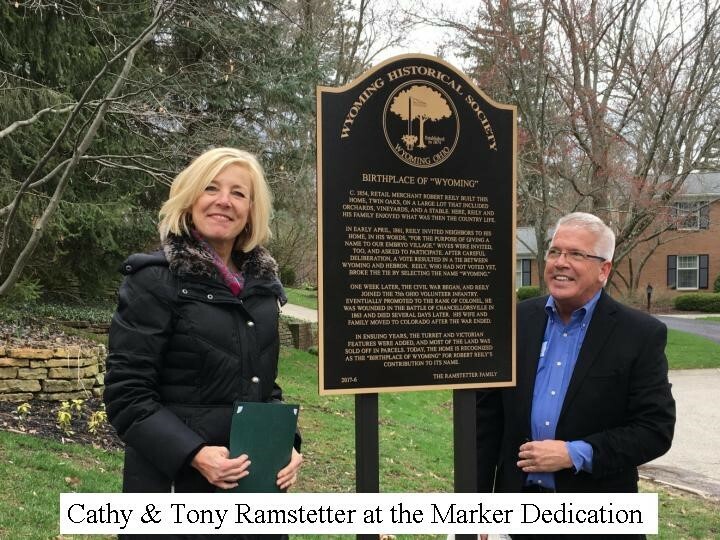 The dedication was followed by a private Historical Society fundraiser/reception hosted by the Ramstetters and in the very room in Twin Oaks where the village naming meeting took place 157 years earlier. This is the Twin Oaks home as it appears today on Liddle Lane off of Reily Road. "While we are not natives of Wyoming, we feel privileged to be the caretakers of such an historical home for the community” said Cathy Ramstetter. “We choose to sponsor the historical marker to help bring a sense of identity to the community, to help remember the house and what happened here. The portrait of Colonel Reily continues to ‘look over’ the Wyoming Room, and ‘greet’ the third grade students when they come for their annual history tour." 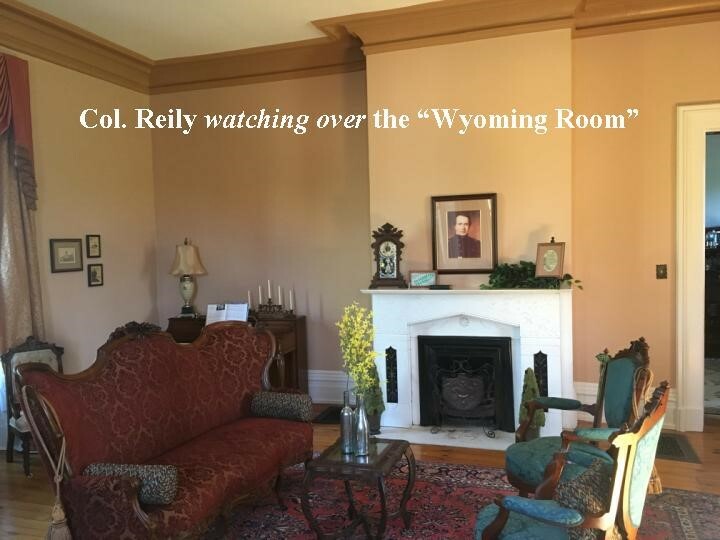 Colonel Reily’s portrait hangs over the fireplace in the Ramstetter’s home. The idea for Wyoming Historical Markers developed two-three years ago out of a Vermont third grade historical-markers project. The Historical Society then met to develop a list of potential markers, and the design of the plague, etc. 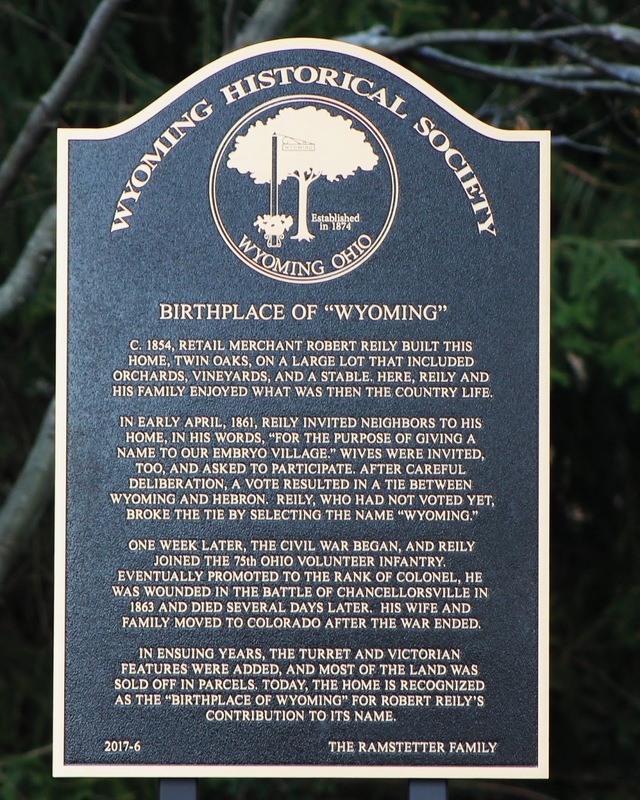 The first Wyoming Historical Markers were dedicated in 2016 to memorialize the original train station just off of Crescent Ave and the “Doughboy” statue at the Civic Center. 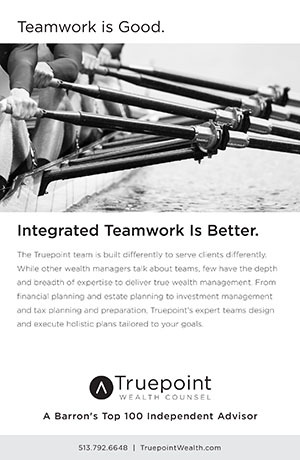 So far, six markers have been created and dedicated. The markers are paid for through private donations, but anyone can propose or sponsor one - residents, families, and businesses. Markers can also be “in honor of” or “in memory of”. 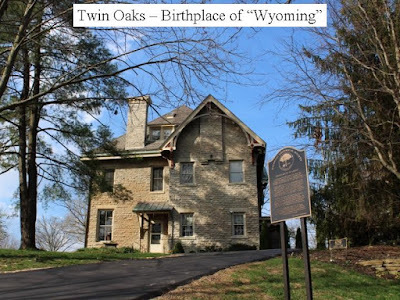 If you think your house has an historical story associated with it and should be considered for an historical marker (such as at Twin Oaks), contact the Wyoming Historical Society to discuss the possibility. On May 18, during May Fete, another Wyoming Historical Marker dedication was held, honoring the original Wyoming Ave. School property on Wyoming Avenue. 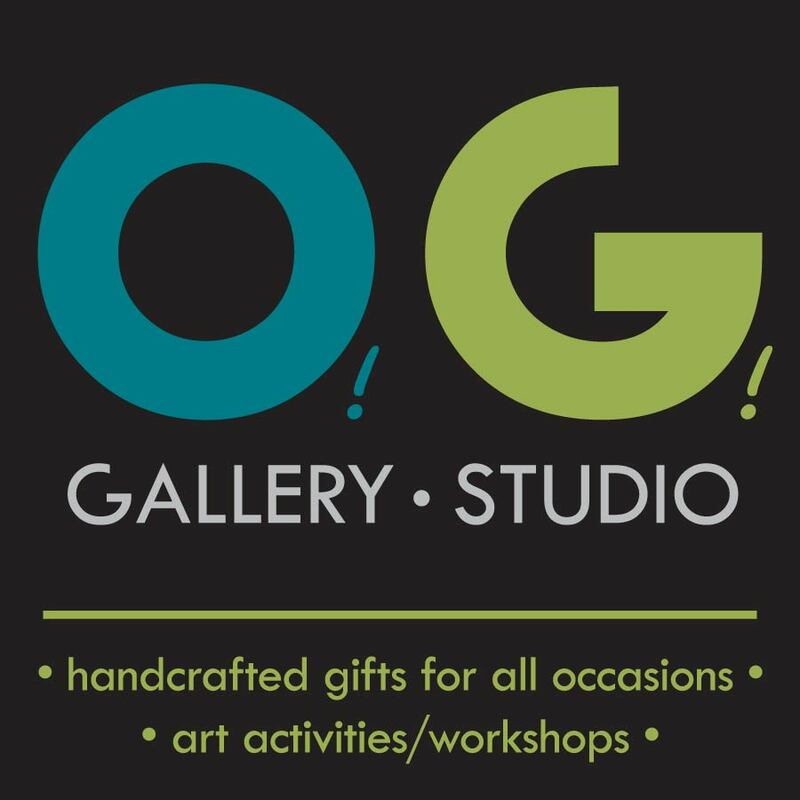 For more information on the markers or history of Wyoming, contact the Wyoming Historical Society at: history@wyomingohio.gov. 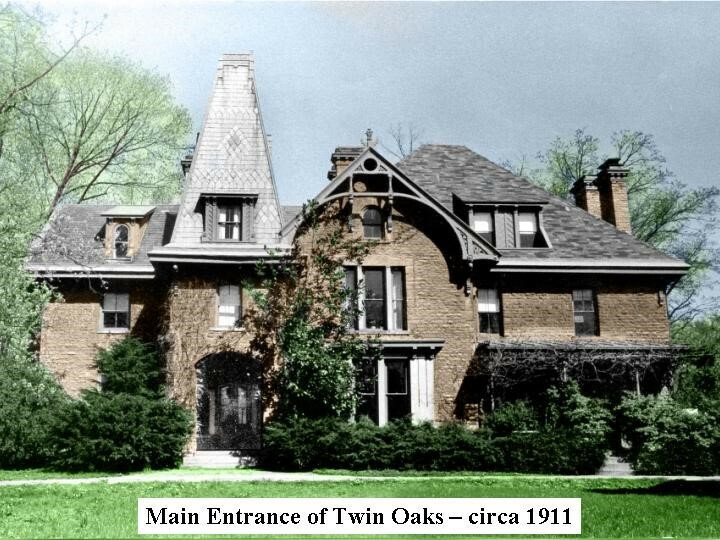 Twin Oaks looked very different in this photograph from 1911.